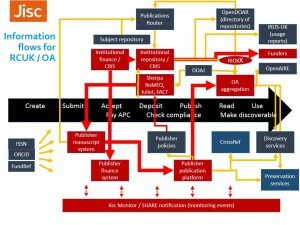 I’ve given a few presentations recently, in which I’ve tried to summarise the technical and information services that Jisc is developing and offering to help universities meet their new obligations against funders’ OA policies. In this post I’m going to share the gist of those presentations. Following the scope of most OA policies, my focus here is on journal articles and published conference proceedings; I’m aware of a lot of challenges and work around monographs and, to a lesser extent, other publication forms, and will address these at another time. My premise here is simple; it is that policy-led OA fundamentally changes the role of a university with respect to journal publishing. 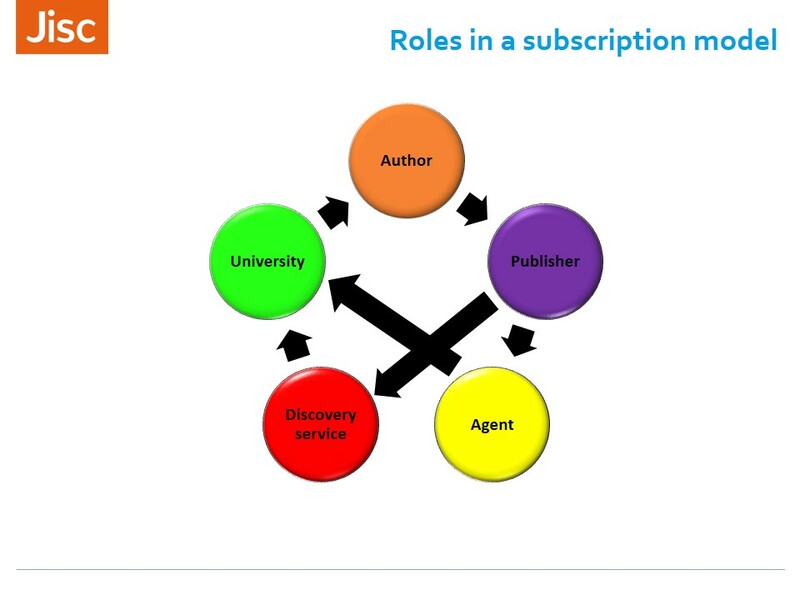 For a long time, the roles in journal publishing were relatively stable, and authors, publishers, serials agents, and libraries knew their place. To explain the Jisc services and their purpose, then I’ll have to spend a few words describing how things are changing. There is clearly the potential for additional burden for universities here, though we should acknowledge that some of the work to monitor publications and expenditure would be needed in any transition to OA, regardless of funder policies. Nevertheless, there are new points at which universities touch the publication process, the most obvious of which is when a paper is accepted, as that is when an APC might become payable (the Research Councils’ preferred option), and when the paper will need to be deposited into a repository to be eligible for the next REF. Here, authors submit to a journal, likely to have an ISSN, through a manuscript submission system. If the paper is accepted, then it is published and, if a library pays a subscription, then their patrons can discover and use the paper, and be assured of its preservation. Policy-led Gold OA changes this. Some systems are common, such as the manuscript submission system, although they might need to adapt and, of course, the university and publisher systems handling the financial transactions operate at a different point. Because we are now dealing with policies, then expressions of those policies by journals and funders are now relevant, are documented in Sherpa-RoMEO and Juliet respectively, and combined into the guidance service Sherpa-FACT, which also draws data from the Directory of OA Journals. 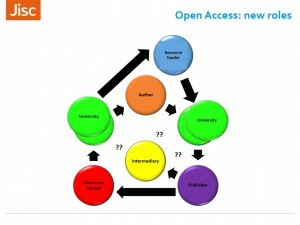 Some funders, such as the Wellcome Trust, require deposit into a subject repository, often undertaken by publishers as a part of a Gold OA regime. Universities now have to report to funders on the implementation of their policy, and there are opportunities to improve a range of services, including discovery and preservation, through aggregating OA papers (see the Open Mirror Report). 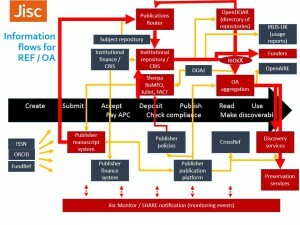 So far so complicated, but this is not the end of the story; policy-led Green OA introduces the role of the repository. Of course, institutional repositories have been around for a long time and are now an accepted and core institutional system. Likewise, the OpenDOAR directory has been running for some time; it lists repositories and provides information to help services interoperate with them, such as an aggregator that might harvest from them. More recently, to help repositories collect papers from their university’s researchers, the Publication Router (formerly Repository Junction Broker) has been working with EuropePubMedCentral and Nature Publishing Group to copy papers from those sources into institutional repositories. So, how does this somewhat complicated set of services and relationships help universities implement policy-led OA? Let’s take the REF policy first. This requires that authors’ accepted manuscripts are deposited into a repository at the time of acceptance. Only two parties are generally aware that this point has been reached, the author and the journal / publisher, and so there are two possible sources for the repository. Either the author refers to Sherpa-FACT to check the relevant journal permissions and funder policy and, if possible, deposits it (perhaps via repository staff) into the repository, or the publisher makes it available in some way. We have been discussing the latter possibility with some publishers, and there is some cautious interest. One of their understandable concerns is the administrative burden of recognising which repositories might want to receive the manuscript, and the ways in which it might be passed on. This is where the Publications Router comes in, as a piece of middleware that might ease this burden. I will be saying more about this here in the next day or so. However the paper gets into the repository, it needs to be discoverable and reportable to HEFCE, and we are working with them and the Research Councils to define RIOXX, a metadata profile that will meet most of their requirements, and for which there will be patches, plugins and support to help universities in its early implementation. We expect a stable version of RIOXX this month. So, what about the Research Councils’ OA policy? The Councils prefer Gold OA. We know that a number of universities prefer Green OA, but even they need to have Gold OA workflows in place where APCs need to be paid. 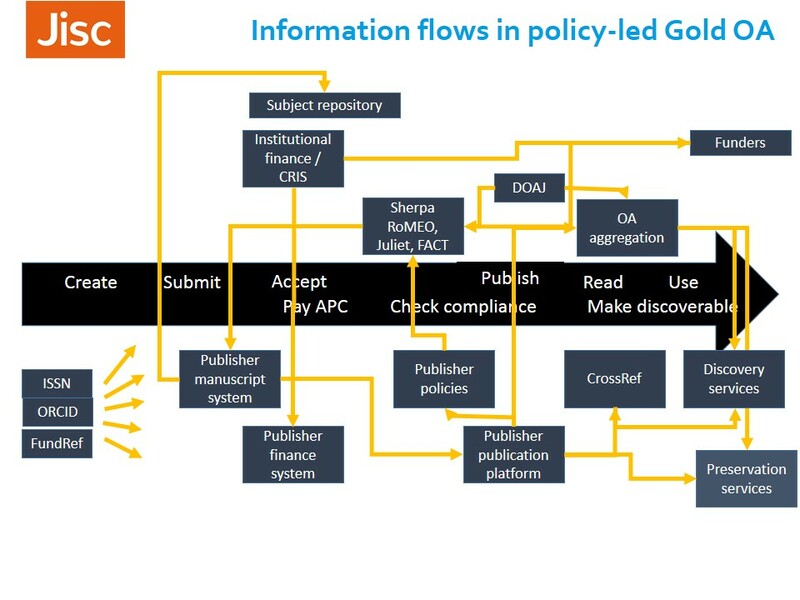 When an author chooses Gold OA, they need information about whether this option, for a particular journal, meets the Councils’ policy, and Sherpa-FACT is intended to tell them. Incidentally, we know there have been concerns about the accuracy of the data in FACT; this will be a topic at the project advisory group meeting this Friday, and we hope to be able to work with funders and publishers to address this concern. Assuming the journal enables the author to comply, or assuming the author makes the decision to publish there anyway, the paper is submitted to the journal’s submission system and, if accepted, an APC might become due. 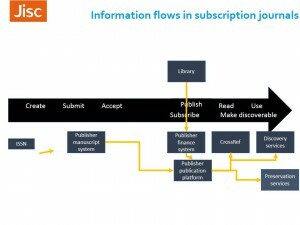 The APC financial transaction between the publisher and the institution needs a lot more definition, for example about the metadata that might flow at that point. 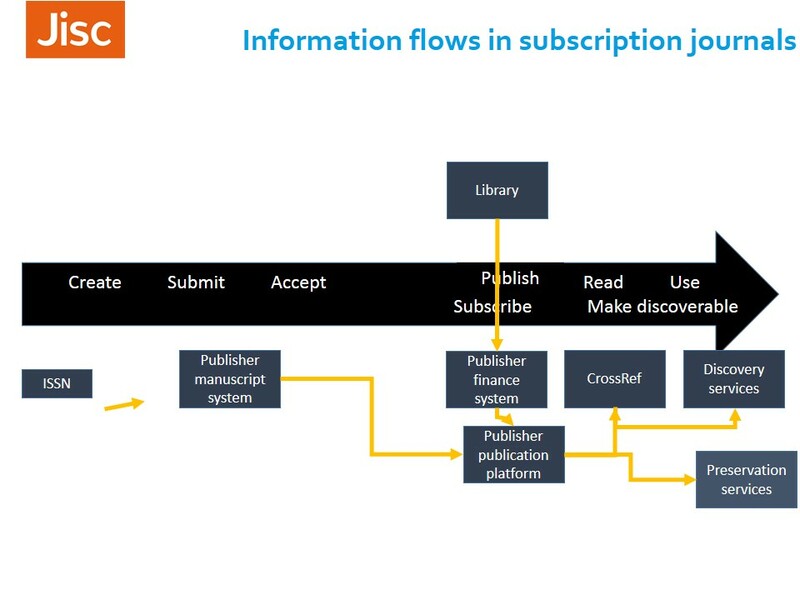 This is one of the areas that Jisc Monitor is exploring, as part of its wider aim to define and prototype services to help universities monitor publications, expenditure and compliance. 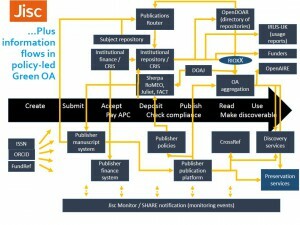 When published, the paper needs to be both discoverable, perhaps through an OA aggregation as well as via other routes, and reportable as part of the university’s compliance monitoring. Again, the RIOXX metadata profile should help here. 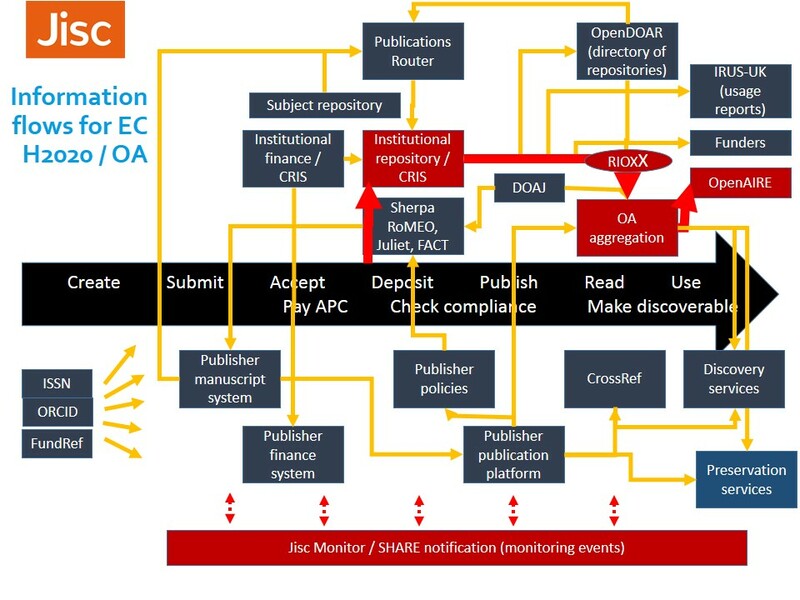 Finally, for this post anyway, the European Commission’s Horizon 2020 programme also has an OA policy, requiring papers to be accessible via their OpenAIRE infrastructure. One of the benefits of RIOXX will be that this can happen automatically, as the OA aggregation, likely to be the CORE service, harvests the material from institutional repositories, transforms the RIOXX records into OpenAIRE records, and passes them to OpenAIRE. 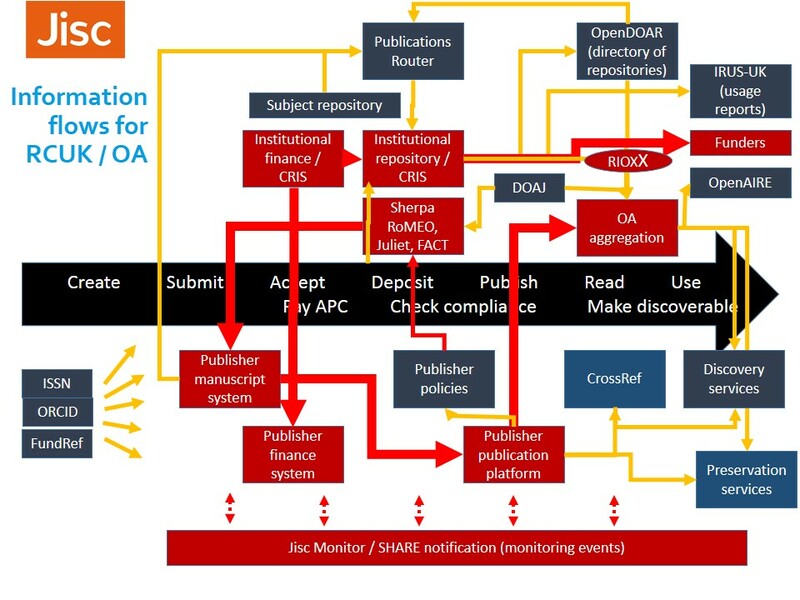 This is broadly the approach taken successfully in the Netherlands, and we think it is likely to be more efficient than OpenAIRE having to work individually with all the UK’s institutional repositories. All of this needs to be underpinned be standards and, in particular, by identifiers such as ORCID, FundRef and DOI. It is no coincidence that Jisc is also helping universities explore the potential of ORCID at the moment. 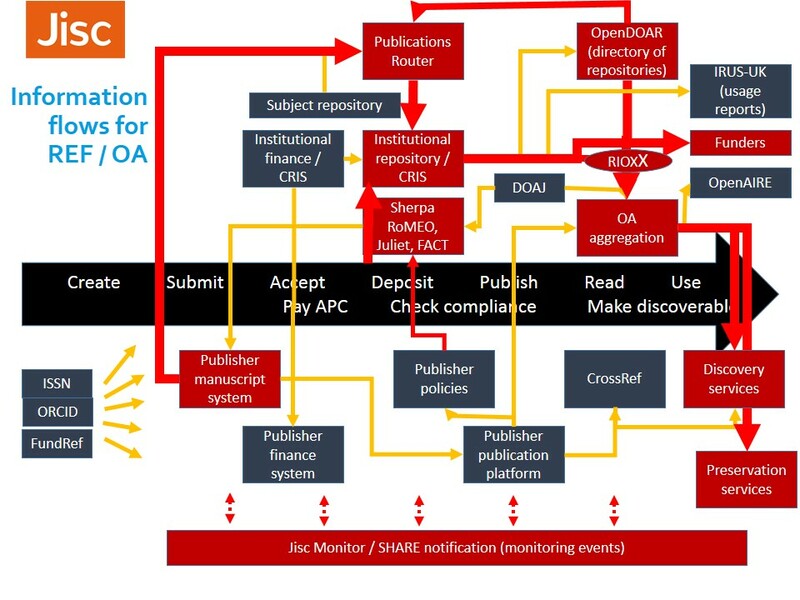 So, apologies that this has been rather a long post, but I hope it has been useful, and I hope it has shown how the work we’re doing does join together into an infrastructure, a set of services, that make sense and help universities implement OA. Believe it or not, there is a lot going on that i have not mentioned above, such as the CASRAI-UK standards work and the Open Access Implementation Community, but I wanted to keep the story as brief as possible. Please do feel free to leave comments below. Posted by Neil Jacobs on June 17, 2014 in Uncategorized and tagged journals, open access, policy, services, standards, support.